Ben's sick and stayed home today, so I didn't weave on the big loom because the air compressor is in the garage, which is under the bedroom. I've been taking care of loose ends instead. I finally put the fallen (?) button back on my purple polo sweater. I did a very bad job of trying to put the Kurume warp leftover on the warping board and left a mound of tangled loveliness on the floor for a week. Or more. 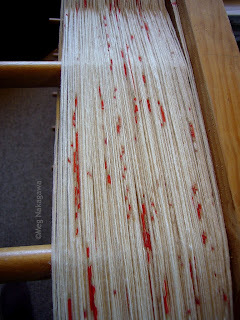 I remedied that today by un-twisting and stretching the warp on the warping board. I thought I counted the number of ends before, but in this flat, ribbon-like warp were 20, not eight, ends, Mom thought the weaver said the length was eight meters, but I knew there was much more, and I estimated it to be about 40, but last count, unless my math is so wrong, (very possible), there are 192 meters of it. I'm not sure how I want to use this warp yet, so it will stay on the board until further notice. At least this way it won't be tangled or twisted. I washed the funny hat, and by washing, I mean somewhere between wet-finishing and gentle hand wash. 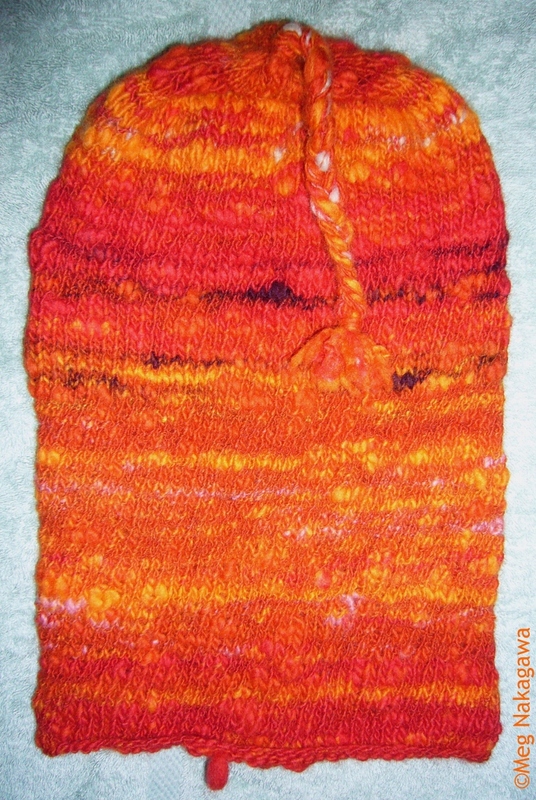 The highly-twisted part of the yarn has fluffed up a little, and the hat is a little shorter, and perhaps a tad wider. I like this better, but it's still wet so I haven't tried it on. 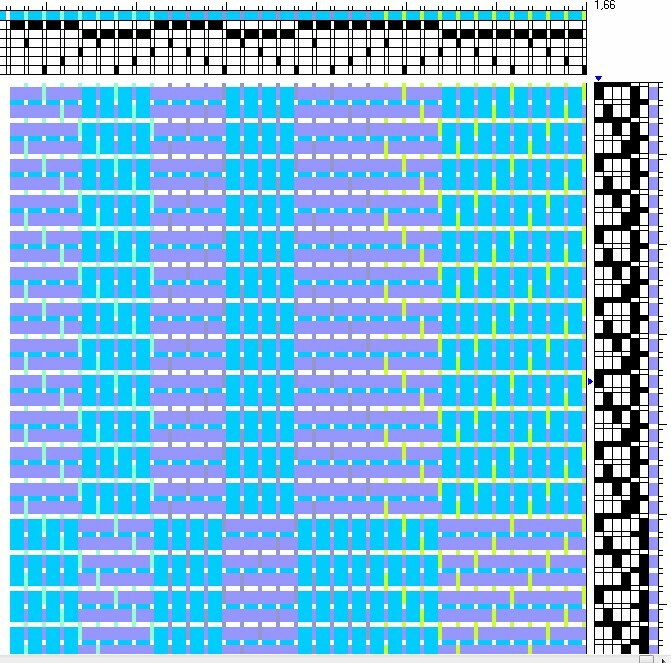 And the rest of the day has been spent threading the Klik sample loom; I made a warp of 2/60 and 2/20 mercerized cotton alternating for a 4-tie block weave. The 2/60s are threaded 1-2-3-4-1-2-3-4-3-2-1-4-3-2-1-4 and in between the 2/20 is threaded randomly in Shafts 5 and 6, providing just two relatively wide blocks. 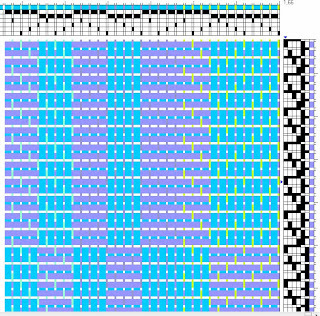 The way I see it, if I want to make a feature of the tie-down, I don't want to use a whole lot of color and/or narrow blocks, so the 2/20 is in one color and just the two blocks. I thought this way I can sample a few small pieces to study how the tie-down works. It's also the first time I'm using two widths in the warp, and I'm not exactly sure how it's going to turn out, but a little exciting. The warp is only a little over a meter, six or eight inches wide, but it's taken forever to thread, and I'm only nearly halfway done.